In this follow up to our introductory game design course, students will dive deeper into the design concepts that make games truly fun to play. Special attention will be given to creating multi-level games that present an ever increasing challenge to the players. Games will be polished with updated graphics, sound, and special effects. Students are welcome to bring their projects from the previous workshop or create entirely new games. Advanced techniques in particle effects and user interface creation. Using a Tile Editor to quickly create multiple game levels. How to incorporate feedback from players to improve their games. 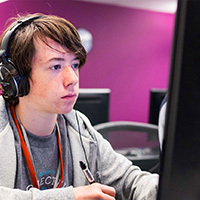 In Junior 2D Game Design, your student will learn that game design is much more than a pastime — it is a challenging and fulfilling field that rewards passion, creativity, and hard work. In this workshop, your student will apply concepts from math, physics, art, and logic as they create games that pay homage to the highly successful arcade games of the 1980’s. Each student will have the opportunity to create a capstone project by choosing from the different game genres presented during the first week. Digital production artists are responsible for producing the amazing visual experiences in today’s video games and animations. Success in this field requires artistic passion combined with a solid grasp of both traditional and digital art skills. This workshop lets you explore the world of production art through a variety of animation projects using non-digital and digital media. Building on the knowledge and experience gained in Level 1 of this course, students are introduced to the traditions of creating engaging character animations. Using both digital and non-digital media, students explore human, animal, and inanimate object-based character animation. Students will also consider issues of personality and story interaction as they produce their animated shorts. Comics share the same fundamental storytelling concepts, whether they are Japanese manga, western superhero comics, traditional graphic novels, or web comics. In addition to developing illustration skills, this course will teach storytelling strategies, character design and development, page and panel layout, and effective use of text and dialogue. Students will utilize what they learn and be guided along the design and production process to complete their own short comic book. Creature designers have the exciting job of using their imagination and artistic skills to create original creatures and imaginary animals for games, film, and other media. This workshop teaches students how to design creatures, from the initial concept stage all the way to the modeling of a maquette (a small sculpture). Throughout this process, students will examine how design elements influence the nature of their creature and how to create them to range from cute to monstrous. This course focuses on developing the visual language of drawing through the observation and rendering of a realistic image. Students will be working with a variety of media including charcoal, graphite pencils and sepia pencils. They will learn how to create depth with perspective and dimension using both grayscale and brownscale. Tabletop role-playing games (RPG’s) are a unique and exciting way to share adventures in fantastic worlds filled with danger and wonder. Central to this experience is the Gamemaster or GM. The GM plans the adventure, sets the stage, narrates the action, and portrays friend and foe to the adventuring party. This course will teach new GM’s how to plan adventures, create and portray 2-dimensional non-player characters, and lead your players from the ordinary world to the extraordinary. From calculators to game consoles, we are literally surrounded by complex electronics. Yet few people have any knowledge of how these amazing devices work. In Junior Electronics, your student will learn about the most common electronic circuits. They will use this knowledge to design, build, and test solid state electronic devices. Finally, they will combine their knowledge of hardware with the Arduino microcontroller to build advanced circuits that play music, drive motors, display text, and sense the world around them. Learning to modify or “mod” the source code of Minecraft is an excellent way to introduce students to programming using a professional Java development environment. While this course is an ideal next step for students who may have been introduced to programming via “drag and drop” environments, no prior coding experience is required. Using a project-based approach, students learn to apply basic programming concepts such as variables, conditionals, loops, and methods, which in turn can be used to create new items, vehicles, and other creations only they can imagine! Play your favorite game on mute or watch an animation in silence and you’ll quickly realize how important sound and music are when it comes to creating a fun and engaging experience. Through the evaluation of a variety of musical instruments, students in this workshop study the science of how sounds are made and heard. Students also learn the fundamentals of sound production and are introduced to the basic process of writing and performing their own music. Expanding on the knowledge and skills learned in Junior Programming Level 1, students will study more advanced programming concepts — allowing them to create more exciting and robust projects. Topics covered include functions, strings, and graphical programming. This workshop includes larger projects that incorporate concepts from both Junior Programming Level 1 and Level 2. In this introductory workshop, students build their own radio-controlled vehicle and learn the importance how to prepare and maintain their vehicle for optimum performance. As students assemble their racer, they will explore the basics of vehicle mechanics, physics, electronics, and radio technology. Participants will learn basic driving concepts and strategies based on official Remotely Operated Auto Racers (ROAR) protocols. Students will go home with their own R/C vehicles, basic driving skills and a newfound appreciation for the RC Racing hobby. In Junior Robotics Level 1, students bring their own robots to life! This workshop explores applications for robotics, as well as the theories and processes necessary to design, build, and program robotic devices. Through the creation of their own robots, students will apply concepts of mechanical systems, embedded processors, sensors, motors, and programming. It’s time to level up our robotics game. In this second-level workshop, students will move in to world of Arduino based robots. Your student will begin by using DigiPen’s own drag-and-drop software to program a robot of their own construction. They will then peak behind the curtain to examine and modify the C code native to the Arduino platform. This workshop is designed to help your student bridge the gap between simpler pre-built robotic systems and our teen robotics workshops. If you have played Pokémon, Magic the Gathering, Dice Masters, or other tabletop games, you may have dreamed of creating your own masterpiece but didn’t know where to start. 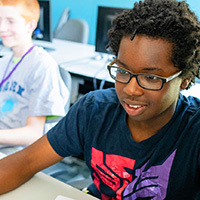 In Junior Tabletop Game Design, students will learn the basics of game design and creation. Students will explore simple card and dice game mechanics, as well as the production process required to take their idea from concept to reality. In this workshop, students learn how to add special effects to games using game engines and art programs. 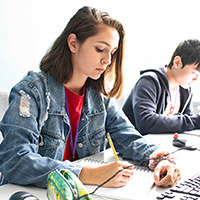 From huge explosions and reading fires, to peaceful snow and gentle rains, students will learn hands-on how video game creators fill their worlds and stories with dynamically generated art. How are websites designed and created? What makes for a good user experience? Using a project-based approach, students will apply web design principles that go into making their very own engaging website. They will learn how to structure a website’s content, how to code basic website functionality, and how to create multimedia content. What do Bilbo Baggins, Harry Potter, and Percy Jackson have in common? They are live in complete worlds filled with rich detail about their respective geographies, cultures, economies, and bestiaries. Building these worlds is an essential element of game design, art, writing, and film-making. In Junior Worldbuilding, your student will create a complete setting that could be the basis of a future novel, film, or game. We will look at real-world and fantasy worlds that your student can use to create a unique setting of their own.